Disclaimer – this recap is not a East Contra Costa Fire vs. Contra Costa County Fire issue, but rather the result of the call volume in each District increasing and both agencies working on a solution that is not ideal, but provides as much service as possible given the engines available at any given time. During Wednesday nights East Contra Costa Fire Protection District meeting, Chief Brian Helmick provided an update on the automatic aid agreement with Contra Costa County Fire. In a District which already had an 8:08 minute average response time in March based on 636 service calls, it is anticipated that the new aid agreement will reduce available engines from Contra Costa County Fire (Antioch, Pittsburg, Bay Point) responding to calls in the East Contra Costa Fire District (Brentwood, Oakley, Discovery Bay and unincorporated areas). Beginning on May 1, an Automatic Aid Agreement between the two districts is being adjusted to provide for more equity in service and a new matrix has been created that dictate responses based on available engines at any given time. The end result of the agreement will mean for East Contra Costa Fire, they are now forced to be a “defensive operations” district on more calls while hoping to work towards an “offensive” operation after arriving on scene which means more lives and property could be lost. According to Chief Helmick, the fire district will be in rescue mode at all times but once life safety issues are mitigated, the District will transition to defensive operations until they can transfer with enough resources to go offensive operations. During the meeting, Helmick says they had been working on a resolution in the agreement for the past two months. Helmick explained in the past, its always been closest resource between the two districts as the metrics were about the same. 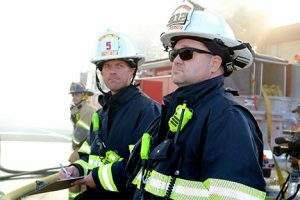 The fives closest engines and two battalion chiefs would respond to fires. He noted that in working with Contra Costa County Fire, they are trying to work with them to provide the best services with the resources available. 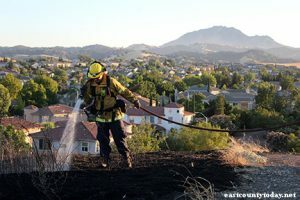 “There is a glaring deficiency of what Contra Costa County Fire can support to us and what we can provide to them and they are trying to balance it out the best we can,” explained Helmick. Helmick noted they are trying to balance it out from a closest resource to the extreme of simply being a mutual aid system—noting a mutual aid system is detrimental to the districts citizens and firefighters. “We have been working very creatively to try and modify the agreement to be a little more balanced between both agencies,” said Helmick noting they will now be focusing on “time on task”. 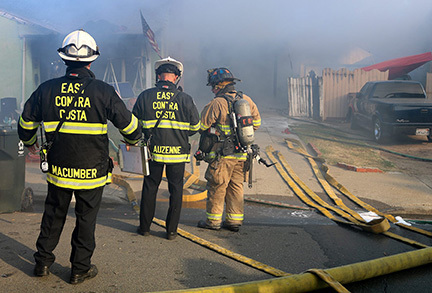 In 2018, East contra Costa Fire requested Contra Costa County Fire to 615 incidents which required 1,074 units and only had 375 units who arrived at scene. Helmick pointed out that roughly 700 units never arrived. Helmick further highlighted they are trying to be creative in requesting resources that they would only be using. The goal is aimed at creating a balanced agreement for assistance between the two agencies. This now adjusts the matrix of how many units respond, how many firefighters are sent to incident, but also Contra Costa County Fire had to put some restrictions based on engines available and how many they could send. Helmick says in their own matrix, they have had to reduce all call types to just 3-engines responding and 1 battalion chief—simply because that is how many resources the East Contra Costa Fire Protection District has. Helmick warned the fire board that there was another layer to this. Helmick warned the Board that if Contra Costa County Fire only has 4-units available at any given time in Battalion 8, they have no units available to send to East Contra Costa Fire. If they have 8 units available, then they have 4-units available for Automatic Aid. Helmick said if East Contra Costa Fire is working an incident with all 3 engines, Contra Costa County Fire can send units based on the metrics up to 4-engines of engines available. “Time and distance is going to be increased,” said Helmick who noted the request for units will increase because it will be coming from outside of Battalion 8 should not units be available in that battalion saying units would come from other parts of the county, or another agency. Helmick closed by thanking Contra Costa County Fire for working with the District and being a good partner and not becoming strictly a mutual aid agreement—which means a unit would arrive on scene, provide an update, then aid would be dispatched. Helmick also pointed out that Automatic Aid is still in place, however, it was now going to be restricted. The updated agreement will go into effect at 8:00 am on May 1, 2019. Battalion Chiefs Auzeen (left) and Macumber (right) on a fire in Antioch. Director Steve Smith asked the Chief what happens if Battalion 8 is working a structure fire and they bring in their own resources to cover Battalion 8, would that increase the number of engines available. Helmick said “yes” because it is available units within the Battalion so if they had 5 units available, they would have 1 unit available for automatic aid. The reverse is if they don’t have anyone available, it becomes a mutual aid request and they could fill it with the closest resource the can which means it could come from another Battalion or another agency. Director Joe Young explained what the District has been saying all along is that the East Contra Costa Fire Protection District is becoming a “defensive agency” as opposed to an “offensive on” and this makes it really clear we are a defensive agency. “In fact, nothing is going to happen beyond those first 3-engines until somebody actually gets there and decides there is a chance to be offensive,” said Young. Helmick confirmed the assessment by young stressing that fact that even with the five units now responding, they are already a defensive agency. Young stated the change was instead of sending 5 automatically, they are only sending the 3 closest resources—which is the 40% drop in resources dispatched to calls. Vince Wells, president of the Professional Firefighters of Contra Costa County Local 1230, called this a great challenge because they have been talking about this aid agreement for some time and how do you protect the firefighters and their working conditions. Wells called it a decrease in resources but from a Contra Costa County Fire standpoint they are depleting their resources by sending units to East Contra Costa County Fire. He also added that they have been involved in three measures to get the community to understand the lack of resources, but the community feels like the resource level are adequate—recent polling confirmed that. Wells said East Contra Costa Fire is getting a lower level of service. Wells stated they recently did a poll and found the community believes the service levels as they stand now are “adequate”. “With CONFIRE putting up a semi-wall if you want to call it that, I think people will see that it is different,” said wells who noted he doesn’t support this but understands its what it has come to. Young asked Wells is part of the issue that Battalion 8 calls continue to increase so the amount of resources are not available like they had been in the past. Wells confirmed. Wells also pointed out that if there is a fire in Antioch, taxpayers in Antioch who pay their taxes want resources available and knowing that East Contra Costa votes have voted down three tax measures, residents wonder why Contra Costa County Fire is sending resources to them. “That is just the reality of it,” said Wells. Chief Helmick clarified Thursday that although the aid agreement is going forward on may 1, they will continue to diligently work on a solution to increase revenues which will allow the district to increase service levels and address call volume and resource challenges. Editors Note: Information pulled from Board Meeting which can be viewed here. What if…… you can what if it to eternity. Like I suggested years ago and continue to is increase the sales tax for the county and prorate the income to the fire districts. I believe the voters would pass it. Trying to piece mill a tax increase on home owners will be tough because home prices are high and their property taxes are way up. A quarter to a half penny sales tax increase would generate almost 100 million annually to divide. The problem is again politics as our county supervisors are not suppporting it. For some reason fire is not a priority over pet projects. What if we went back to before the 08’ crash. What if we still had all the stations we had then? What if all our taxes went where they belong? What if, what if? What if our property values, yes they are more than before 08 when we had 8/9 stations, so why not now? What if our property taxes hadn’t exceeded where they were when we had 8/9 fully staffed stations. What if development increases as it has and we still don’t have money to fund the ECCFPD. What if is BS! There is no doubt the funds collected are there for the ECCFPD. What if the funds went to the ECCFPD? What if??? ?